TradeGecko	is ready to help you get the answers you need. TradeGecko	will reply to your questions about Get extension name	shortly. We appreciate your feedback about your support experience with TradeGecko, developers of TradeGecko. This helps us maintain high standards on the WooMarketplace, and helps TradeGecko improve. Glad to hear it went well with TradeGecko. Tell us more. Did TradeGecko get back to you? Do you have any additional feeback for us or TradeGecko? Requires an account with Tradegecko, starting at $39 / month. Don’t stitch together your supply chain. Your time is valuable and better spent focusing on your customers and products. Free up countless hours of your team’s time and manage your entire commerce and supply chain ecosystem from one central, integrated system – from production through to fulfillment. Save time and sell more! The time spent managing operations across countless spreadsheets and manually updating accounting ledgers, sales channels and inventory systems could be better spent serving your customers. TradeGecko and our connected ecosystem of applications and tools lets you free yourself from the business of running your business and focus on growth. Integrate with accounting applications: QuickBooks Online and Xero. Automate order routing & logic by easily creating workflows with TradeGecko Connect. Easily expand to more eCommerce channels and marketplaces including Amazon, eBay, Etsy, Lazada, Jet, Walmart marketplace, Wayfair, Joor, and more. Grow (or create!) your wholesale business with EDI integrations and TradeGecko’s B2B eCommerce portal that has unique storefronts, catalogs and price lists for each of your buyers. Make your warehouse team more efficient by leveraging TradeGecko’s apps to receive stock, take stock, pick, pack and ship with a barcode scanner (and print barcode labels!). Manage invoicing and accept digital payments on invoices – get paid faster with TradeGecko Payments in multiple currencies and countries. Integrate with countless 3PLs and Fulfillment by Amazon. Intelligence you can count on! Take the guesswork out of growth with TradeGecko Intelligence. We’ve specifically designed our reports and forecasts to help TradeGecko’s customers grow, intelligently. 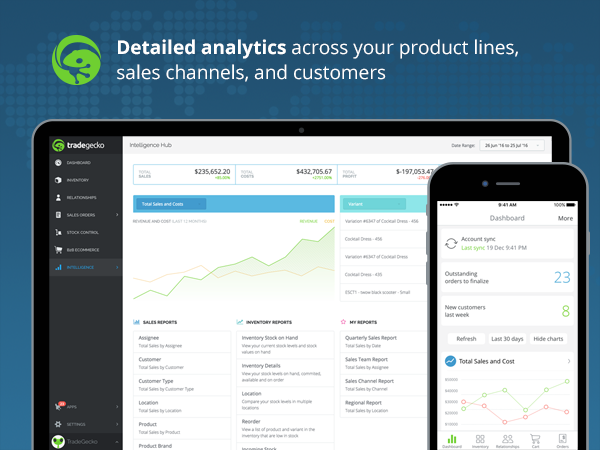 Analyze the performance of all sales channels, products and buyers. Monitor transaction history reports, account balances, late payments and orders. Plan ahead with demand forecasting to ensure that you never overstock or sell out and miss potential sales opportunities. Calculate commissions with clarity based on invoice or payment dates. Easily manage inventory of components, subassemblies and finished goods across multiple locations in real-time with TradeGecko for Manufacturing. Track components, subassemblies, finished goods, labour, and wastage, while integrating seamlessly with Xero and QuickBooks Online. Stock is automatically allocated as purchase and production orders are created. Connect with MRP ecosystem partners to gain complete floor level control, task assignments, master production schedules, production routing and more. Our Customers love TradeGecko. Their words, not ours.